Heat olive oil on low heat and add chopped onion. Cook until soft. Then add mustard seeds and stir over low heat. Add grated ginger and crushed garlic. Stir mixture well to avoid burning. Add curry powder, turmeric and chilli. Stir through. Then added lemon grass and stir. Add water and coconut milk and on low heat bring the sauce to a simmer. Taste the sauce prior to adding other ingredients. 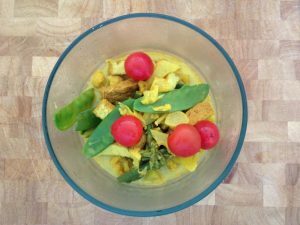 Add more curry, chilli or ginger if you’d like additional spice, or add coconut milk to tone down a spicy yellow curry. Stir through mixed vegetables and simmer for approximately 5 minutes (vegetables cooked but firm). You may need to added additional water. If you are adding a leafy green vegetable, add it within the last 5 minutes of cooking. Add your protein option and stir. Cook for approximately 5–10 minutes, until prawns are cooked through or the vegetarian option is hot. Add tomato 5 minutes prior to the end of the cooking time. Mixed vegetable combinations that work well sliced pumpkin with kale; carrots, broccoli, zucchini and snow peas; carrots, cauliflower, green peas and beans. Choice of tofu, tempe, chickpeas or prawns. Increase spice by adding extra ginger and/ or chilli. Decrease spice by adding less ginger and chilli and adding more coconut milk. Increase the number of serves by proportionally increasing the ingredients e.g. for eight people you would double the ingredients.